Weekends are studio days for Christopher Saunders, who works a regular 9 to 5 job during the week. 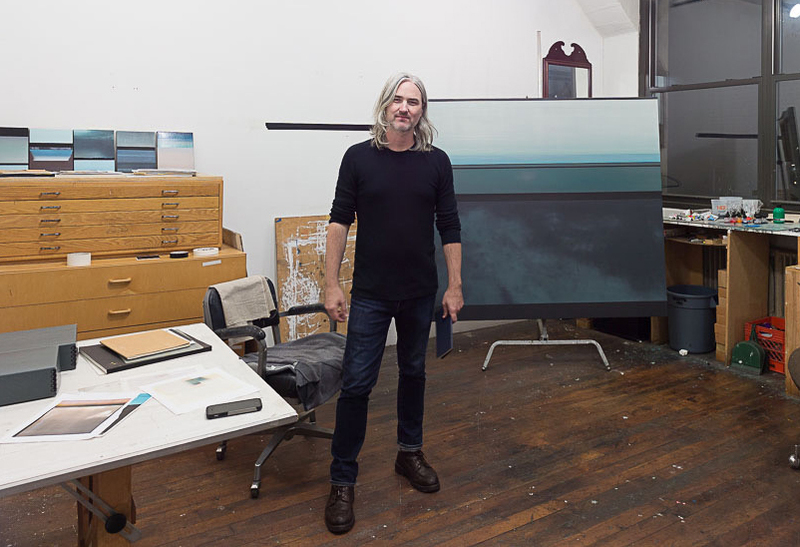 Meeting up with him early on a Saturday morning, Bicycle Fine Art had the pleasure of visiting the contemporary artist in his Greenpoint, Brooklyn studio and seeing his new body of work. Upon entering the light-filled artist’s space in the former Pencil Factory, paint splatters are noticeable on the floor and bottles of different colored inks next to multiple canisters of brushes are laid out, ready to be used. In one corner, there is a pristine rack of flat files while across the room there is a collection of paintings in shelved cubbies, just nestled behind a cozy 2-seater sofa, inviting curious visitors into the creative space. A white bookcase, lined with a manner of art books from Rembrandt to Peter Doig as well as the Lord of the Rings trilogy by J.R.R. Tolkien, begin to paint a picture of who Christopher is as a person and artist. While some of the books on the shelf harken back to his early days as a figurative artist, Christopher has since abandoned the human form to explore the intriguing and timely relationship between nature and technology. Moving on from figuration, Christopher turned to landscapes as his main subject, a theme that has continued to inspire his main body of work. Christopher has deviated from the traditional subject to that of abstraction, most evidently in his current body of work on paper. In his own words, “landscape is subliminal or tenuous on purpose. I always want some sort of nod to nature or landscape in some way.” Christopher also notes that while Western art history traditionally associates the landscape with the horizontal composition, he sees himself as more globally inspired: “There are traditions around the world where it’s vertical and that’s more interesting to me as a format.” His compositions not only pay homage to other art historical traditions, but to new technological advancements as well. 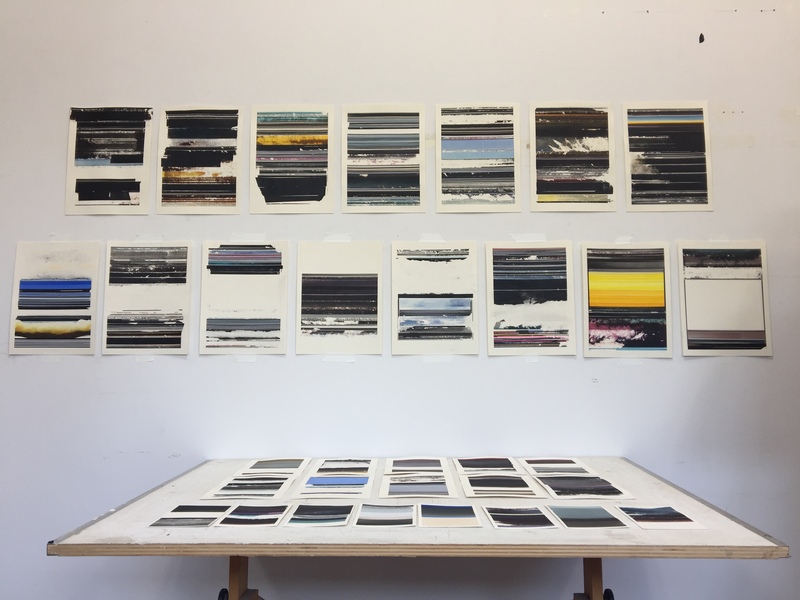 Laid neatly on a drafting table are 4×6 and 9×6 inch works on paper, earlier explorations that Christopher used as a launching point for the larger 12×9 inch ones on the wall. These smaller works appear as mere snapshots like the once popular 35mm developed photographs, which were printed in the same size. Remarking on the scale while nodding to the large linen canvas resting against an adjacent wall, Christopher relays that these small paintings are individual pieces and are part of a series. Yet in the consistency of these works lie concepts that appear unresolved and waiting to be discovered. When asked what sparked the creation for his latest body of work on paper, Christopher responds, “I wanted to pause from oil painting, to do something closer to drawing. I haven’t done that for over a decade.” He further notes that the use of ink and its relation to drawing comes from “wanting to do something more immediate, something more accidental.” While simultaneously toiling on the larger oil painting looming in the corner, Christopher felt a gravitation toward creating something that can accommodate both his work and studio schedules. Delegating his art-making time to the weekends, Christopher acknowledges that his creative time is finite. Making these smaller works allows him to work quickly, while still challenging himself through a medium that he has not explored in ten years. Though these works are smaller in scale, “they are their own reality.” Christopher sees these works as fully realized, individual pieces. He notes that “some of them can translate to another language,” in this case, oil painting, but they are never seen as sketches or mock-ups. Considered as a series, Christopher envisions floating these individual works within their own larger scale frame, using the negative space of the mat to further encourage close inspection. Upon seeing the collection, Christopher wants viewers to recognize “that there’s an evolution happening, but they are all informing each other.” The ability to focus on each piece individually while simultaneously seeing the entirety of the series allows one to see the process. The 4×6 inch studies are strikingly akin to Rothko color field explorations. Following Christopher’s progression in his new paintings, one can begin to see a shift in concept and technique. While larger blocks of color are still evident in the 6×9 inch works taped on the wall, there is a clear development. Looking at his works, the idea of synesthesia comes to mind, especially with the rhythmic-like staccato interpretation of lines and colors interacting with one another. When asked if music has an influence on his work, Christopher responds, “Music is really important. I listen to a lot of music when creating; mostly minimal composition stuff, piano-oriented work, music based out of open space with lots of repetition.” Almost as if adding another medium to his palette, the repetitive tones that Christopher listens to directly translate into the work he creates with the ink and brush. 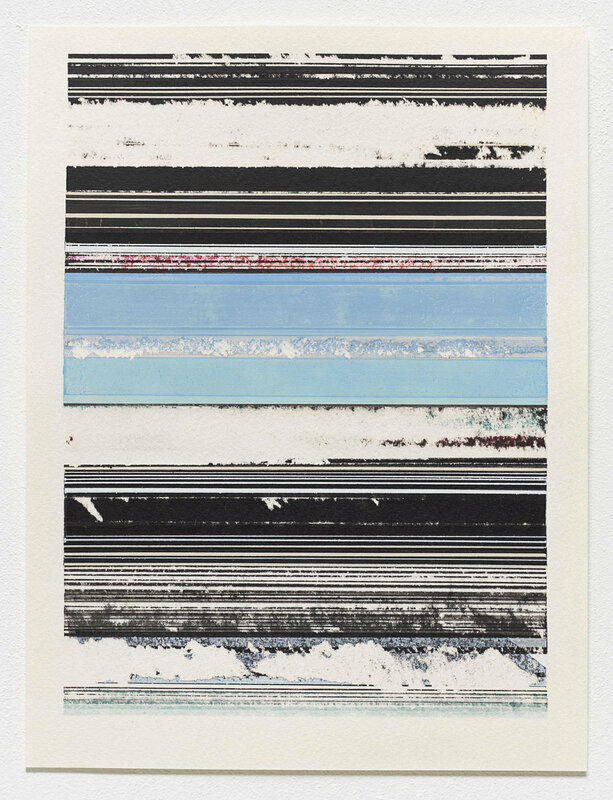 Smaller lines, broken up by the application and removal of tape and other methods of redaction, are evident, and correlate to the discordant sounds that influence Christopher’s work. 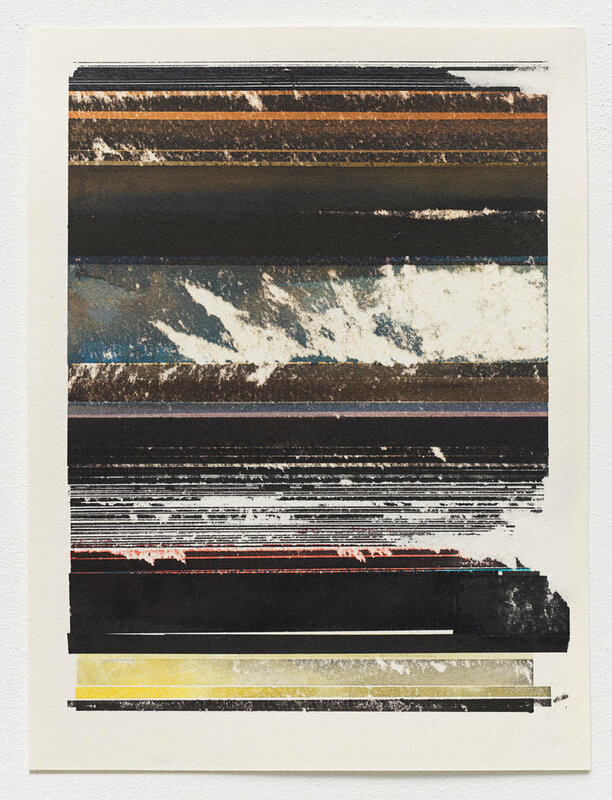 Like listening to old vinyl records or watching an old VHS tape, a granularity appears through the varying textures created congruently by the use of his different methods and media. While experimenting with the process of painting with ink, Christopher began to use masking tape as way to “lift up color.” These imagined landscapes have no direct image for reference, relying on tape as a positive and negative tool to form the composition, as well as build up and strip away the surface layers. On top of using tape as a redaction tool, Christopher shares, “I occasionally use some sanding; mainly to add disruption for the ink, but also to level out the surface sometimes.” In relation to the concept of landscapes, Christopher notes that he wants there to be some topography in these ink works on paper, especially after the formative effects of tape and sanding. Working from instinct; white voids are present, all evidence of Christopher’s process. He notes that “those blanks spots are 1:1 in relationship with my brain,” unresolved, waiting for him to continue to finish the process. Yet as Christopher is discovering, there is a limit to how much certain materials can handle. Illustrating his paper restoration and patching skills, he points to one of the pieces on the wall. “I accidentally burned a hole through this section and covered the back with paper.” Unlike his previous works, where oil painting can sometimes be more resilient in the face of errors with the option to simply paint over mistakes, Christopher is now challenged with mastering his adeptness using an unforgiving surface. Because of its delicate structure, in contrast to canvas, when it comes to works on paper, Christopher remarks, “You might only get two takes.” Although it is daunting to begin a work, or in his case, to continue to resolve an unfinished piece, Christopher hasn’t thrown any of the newer paintings away. Even if a work is not a “success” by his standard, Christopher sees potential in previous explorations, as they pave the way for further development in his most current series. View more studio shots below or go contact: info@bicyclefineart.com to make an appointment to view any of these works in person.